This book is written for Indonesian policy analyssts and policy makers and for students and practitioners of agricultural policy in Indonesian universitics. The purpose is to introduce a method of economic analysis to evaluate public invesment project and public policies in the agricultural sector. An approach called the policy Analysis Matrix (PAM) is designed to serve that purpose. 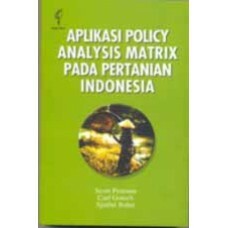 The PAM approach has been used widely to analyze Indonesian agricultural issues. In this book, the authors explain the conceptual essence of the PAM method, provide recent case studies of PAM analysis in Indonesian agricultural, and give is to make the PAM method easily accessible for wide use in Indonesia.